The roots of Beaux Arts Village can be traced to the Society of Beaux Arts, a "school of every art and craft", established to develop art and its appreciation here in the Northwest. The Society was housed in the old University Building in downtown Seattle where the Four Seasons Olympic Hotel now stands. Members of the Society dreamed of starting an art colony where they could live and work together. Three members of the Society, Frank Calvert, Alfred Renfro, and Finn Frolich, signed their names to the incorporation of the Western Academy of Beaux Arts in 1908 and purchased a 50-acre tract of forest land, setting aside ten acres in the center for sketching grounds, workshops, cricket, a tennis court, and healthful recreation by members of the Beaux Arts Society. Calvert deeded the 1,100 feet of Lake Washington shoreline and street rights-of-way to the Western Academy and held title to the central ten-acre "Atelier Square" himself. A four-foot strip of land on the south side of the Village and a two-foot strip on the north were kept private property to prevent outsiders from making the waterfront a public beach. Certificates for membership in the Western Academy of Beaux Arts sold for $200, and certificate holders were eligible for a $250 reduction in the price of a lot; however, sales of homesites were not brisk. The Beaux Arts ferry dock was at least 40 minutes from downtown Seattle by steam launch to Leschi and then by the Yesler trolley line. There was no electricity or phone service, and water was carried from the lake by bucket. Groceries had to be purchased when the grocery scow docked once a week or were delivered by wagon from a grocery in Midlakes. Renfro built the first home, at what is now 2873 102nd Ave SE, and moved in to it in 1909. By the time Calvert built in 1912, at what is now 2801 102nd Ave SE, there were a total of six owners in residence. James Ditty, another pioneer, built his home, at what is now 2811 106th Pl SE, in 1912. In addition to his Beaux Arts property, Ditty owned much of downtown Bellevue, eventually deeding several blocks to the City of Bellevue for Bellevue Way. By 1916, there were 15 property owners living in the Village and another 63 owners held titles to lots and could vote on Village business. 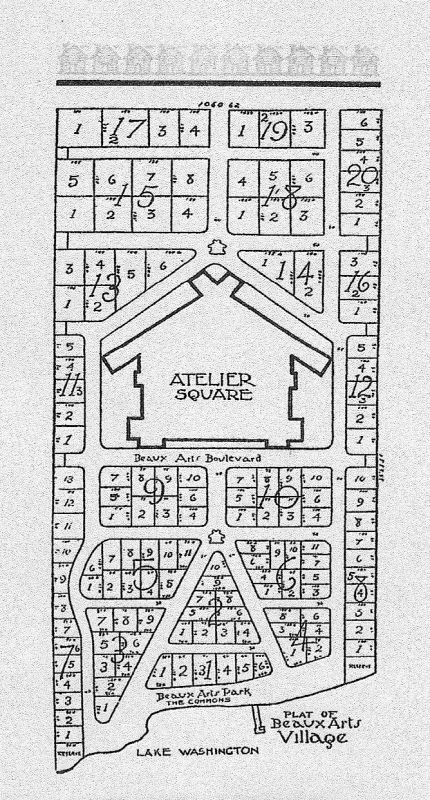 Calvert sold "Atelier Square" to the Western Academy in order to finish paying off the loan on the 50 acres. During the Depression, the Academy forfeited the property to King County for back taxes. In the early 1940's, the Beaux Arts Water District purchased the land from the county and sold it for homesites. Thus, the dream of a communal center for artistic endeavors was lost, but the communal beach remained as a focal point of Village life. Access to the beach has always been available only to members of the Western Academy, which had to approve any sale of Village property. With the completion of the I-90 Bridge, access to areas on the eastside of Lake Washington improved dramatically, and by the 1950's the city of Bellevue was expanding rapidly. Beaux Arts property owners wanted to guarantee that they would not be annexed and that the beach would remain private. To protect the beach and the Village lifestyle, Judge Storey Birdseye urged his fellow residents to incorporate as a Town in 1952. Alas, incorporation as a fourth-class town required a minimum population of 300, but the Village's population was slightly smaller than 300 in number. The call went forth for new residents, and the incorporation goal was met shortly thereafter in 1954 with 304 Beaux Arts residents. Mothers contributing to the population increase were made members of the prestigious "300 Club." Two governing bodies now administer the business activities of Beaux Arts Village: the Town Council and the Western Academy of Beaux Arts. The Town Council consists of a mayor and five council members, all of whom are unpaid and elected at large from and by the residents of the town. The Town Council oversees municipal matters, including all roads (other than the north and south beach roads) and public rights-of-way, the Beaux Arts water system and well, police and fire protection, and other municipal business. The Western Academy of Beaux Arts (WABA) consists of all property owners in Beaux Arts who elect five volunteers each year from among the membership to serve as the WABA Board of Trustees. WABA is responsible for beach matters, including the north and south beach roads, the 1,100 feet of community beach, and the docks and floats. 1908 Beaux Arts Village founded by Alfred Renfro, Frank Calvert, and Finn Frolich. 1911 First Beaux Arts School founded in a one-room school house located just south of the Village and used for two years. 1913 Second Beaux Arts School founded in a four-room school house located just north of the Village on the grounds currently occupied by Enatai Elementary School (part of the Bellevue School District). 1913 Beaux Arts Post Office established first at what is now 10605 SE 29th and then at what is now 2708 106th Pl SE. The Post Office offered daily mail delivery. In 1922, Rural Delivery was inaugurated to mail boxes located at two convenient places in the Village. In 1952, City Delivery replaced rural. 1917 Electricity brought in with just ten lights in the entire Village. Puget Power took over this service in 1954. 1921 First Summer Picnic held. 1921 Telephone service brought to the Village. 1946 First Winter Dinner held at the Enatai Community Clubhouse (originally the second Beaux Arts School). 1954 Beaux Arts Village incorporated as a Fourth-Class Town. First Beaux Arts Directory produced with a map of Village residents compiled by Paula Carlson. 1960 All American City Award given to Beaux Arts for helping to clean up Lake Washington. 1965 Washington Natural Gas franchise granted by the Town. 1965 Sanitary sewers installed by City of Bellevue. 1967 First sailboat racing program begins; later to be renamed B.A.R.F. (Beaux Arts Racing Fleet). First Beaux Arts Arts and Crafts Fair held. 1972 Beaux Arts Beach designated Open-Space Greenbelt Recreational Property by Town Council. 1974 Bi-Centennial Community status officially declared for Beaux Arts Village and Bi-Centennial Celebration held. Current and former residents invited to parade, tea, games, picnic, program, dance (on tennis court), dedication in North Beach parking area of monument designed and executed by James Moorehead. 1977 First Beaux Arts Cookbook published by Chris and Sarah White. 1981 East Channel Bridge reconstruction completed in August. 1981 Petition and fund drive supporting the construction of a Town Hall gains 66 signatures. 1986 First Green Book provided to Village residents. 1989 Town celebrated Washington State Centennial with parade, picnic, Renfro House plaque and time capsule. 1989 Bulletin and WABa newsletter jointly issued as Beaux Arts Village Volce. 1993 WABA docks updated and expanded with funding from bonds issued by WABA. 1997 Historic Seattle Home Tour takes place in the Village. 2000 Census puts Village population at 306. 2004 Beaux Arts History Committee forms as Town HIstorian Anne Rutledge retires. 2005 Commons oversight initiated by WABA President Jim Airy, envisioning and redifining Commons oversight with three branches: Beach, Docks, and Woodlands. 2006 Woodlands Committee forms to draft charter policy for new Woodlands Master Plan, woodlands mapped and inventoried. 2008 Western Academy of Beaux Arts celebrates in 100-year anniversary with a Home Tour, Old-Timer's Picnic, Parade, Eastside Heritage exhibit and more. Talking About Beaux Arts book is published by Joann Bromberg with the help of many Villagers. Town adopts Tree Code. WABA website foes live. 2009 Town adopts Right-of-Way Code. WABA creates a Shoreline Committee to oversee a shoreline restoration project funded by WRIA8. 2010 WABA Dock Bond Fund paid off. 2011 WABA makes significant repairs to dock pilings and adds boat lifts. Town adds walking path and landscaping along 108th Ave SE, hires a Hearing Examiner to replace the Board of Adjustment. History Committee creates plaques for Centennial Homes. 2012 WABA completes Shoreline Restoration Pahse I. Town publishes Municipal Code online. The Beaux Arts history scrapbooks and filesare kept at an off-site storage facility and are maintained by members of the History Committee. These records, dating back to the Village's founding in 1908, include a large and fascinating collection of newspaper and magazine articles and other documents about Beaux Arts Village and its residents, as well as photographs of the Village, Villagers, and Village events. They are often brought to the Winter Dinner and Summer Picnic for the enjoyment of all who attend those events. The History Committee consists of a small group of residents willing to volunteer their time to help organize, maintain, and make available to Villagers these records and memories of the community's past. The committee appreciates your help in locating information about the Village and it residents. PLEASE submit articles about members of your family, pictures to update the "House Book", school activities and honors, athletic participation, promotions, business activities, or other material you wish to include in the scrapbook. The only way for things to become part of the official Town history is for the Committee to receive items!